The moment a child arrives at their Children's Miracle Network Hospital, a miracle is in the making. With your support, we can give more local kids the miracles they deserve. Since 1983, Children's Miracle Network Hospitals has raised more than $5 billion -- most of it $1 at a time -- for 170 children's hospitals across the United States and Canada, which, in turn, use the money where it's needed the most. These donations have gone to support research and training, purchase equipment, and pay for uncompensated care, all in support of the mission to save and improve the lives of as many children as possible. Right now there's a Children's Miracle Network Hospital working to save the lives of kids in your community. In fact, 62 children enter a Children's Miracle Network Hospital for treatment every minute - that's one child every second. Some are battling cancer. Some are suffering from a traumatic injury. Others require constant care because they were born too early, or with a genetic disease. Children's Miracle Network Hospitals has raised more than $20 million for southern Nevada making Children's Miracle Network Hospitals one of the largest contributors to the development of pediatric services in the Las Vegas Valley. Most funds are generated through donations from corporate sponsors as well as through special events such as the Torch-Relay Walkathon sponsored by Marriott and National Pancake Day sponsored by IHOP. 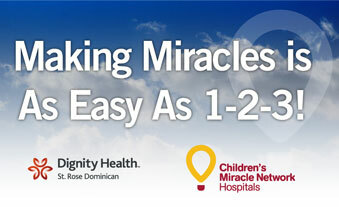 Dignity Health - St. Rose Dominican partnered with Children's Miracle Network Hospitals in January 2005. Since then, 100 percent of every dollar raised in southern Nevada, goes to St. Rose Dominican's Pediatric Centers to provide pediatric equipment, charity care, and health education for children.Your support of Children's Miracle Network Hospitals helps ensure that children have the specialized care they need and deserve. To learn more about Children's Miracle Network Hospitals, please call Debi Walsh at 702.616.5755 or Jason Williams at 702.616.5756. Our dedicated sponsors together with our hospitals, and media partners, make Children's Miracle Network Hospitals the most effective, efficient, and compelling example in the world of people working together for kids. Team up with St. Rose through any of these CMNH events to help fund medical miracles! Every dollar raised will benefit the medical care and support services that sick and injured children receive at St. Rose. Panda Express has 67 locations that support CMN at St. Rose all year long. They do a round-up campaign, a coin canister campaign, employee giving and also sell balloon icons at the register. Credit unions across the nation offer members the opportunity to “skip” their loan payment for a nominal processing fee. Most credit unions charge processing fees between $20 and $40 per loan payment skipped. 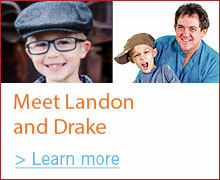 Credit unions can choose to donate all or a portion of the fees to their local CMN Hospital. Clark County High School students will participate in the 6th Annual CMN Dance Marathon at UNLV's Student Union Hall from 1:00 - 8:00 p.m. Participants will stay on their feet for seven hours in honor of sick kids treated at St. Rose. All monies collected stay local to support the Pediatric and Neonatal services at the hospital. Ace Hardware retailers round-up purchases during April to support their local CMN Hospital. Being born prematurely and critically ill is traumatic. Fragile newborns are helpless, and frightened parents often feel powerless in the complex neonatal intensive care unit (NICU). St. Rose prioritizes minimizing stress experienced in the NICU and empowering parents as care providers. That’s why the hospital’s partner, Children’s Miracle Network Hospitals, recently funded a Touch a Life, Impact a Lifetime Workshop for all members of the interdisciplinary team that interact with tiny patient and their parents. The workshop led by Mary Coughlin, an internationally recognized expert in trauma-informed NICU care, emphasizes how team members can meet stringent care standards while also creating a more peaceful, nurturing experience that will benefit the entire NICU family in the short-term and over a lifetime. Neonatal ventilation is highly complex and challenging. Caring for the smallest patients at St. Rose is one of the most demanding tasks imaginable. For these infants, new specialized neonatal ventilator technology is paving the way home. To prevent pulmonary injury, immature lungs, and underdeveloped breathing, regulation mechanisms require extremely gentle ventilation, advanced sensor and compensation technology. With community donations through Children’s Miracle Network, St. Rose recently acquired 6 new Dräger Babylog VH 500 ventilation systems to better care for these precious patients. Millions of Americans are underinsured or go entirely without health insurance each year. Last year alone, Dignity Health - St. Rose Dominican provided over $6 million dollars in pediatric charity care to Nevada’s families. As southern Nevada’s only faith based, not-for-profit health care system, St. Rose’s charity care program is critical to getting the health care people need without regard to their ability to pay. This uncompensated health care, which is provided free or at a reduced cost, makes an invaluable difference in the lives of thousands of Nevadans every year. With donations from the community and our Corporate Partners, Children’s Miracle Network was able to transfer $1.8 million dollars of precious funds to the hospital last year for the use of pediatric charity care.